A while back, when we first got our copy of The Best Veggie Burgers on the Planet the first recipe we tried was for the Denver Omelet Burger. While we really the idea, the resulting texture was described as pasty and it felt like the peppers and onions overwhelmed the vegan bac’n bits. I’ve always wanted to return to this and try changing a couple of things to create something very inspired by Joni Marie’s original recipe, but with a bit more texture and less oil. The Great Vegan Gluten-Free Burger Experiment is the perfect time to revisit the recipe! I actually removed all the oil called for in the recipe save some spray oil for sautéing the pepper, onion, and garlic as well as some for the cast-iron drop biscuit pan. Once again this pan is the perfect thing for baking vegan burgers! Other changes: I used a single, large orange bell pepper and only half a medium onion, both diced quite small. I used a couple of cloves of chopped garlic too. This I sautéed in a cast iron skillet until the onions started to caramelize. I pressed the heck out of the tofu, thinking this was part of the texture problem the first time we tried. Next, rather than blend the tofu with oil and spiced, I just crumbled it up fine in a bowl, added all the spices in with the tofu and mixed it up by hand. To bind this all I stuck with the chickpea flour (besan), but reduced to 1/2 cup and added 1/2 cup of gluten-free, instant oats as well. I also decided to throw 1/4 cup of nutritional yeast in there for stickiness and saltiness. I left out the salt the original recipe called for, but I think it should stay in with the next try with this revamped recipe. One little change I make with all recipes calling for liquid smoke; I use smoked paprika instead. Since the original recipe called for 1/4 teaspoon of paprika, I just increased to 1/2 teaspoon of sweet, smoked paprika. The results, all squished together by hand, were promising and held together well, especially after letting the mixture stand for five minutes to let the oats hydrate. 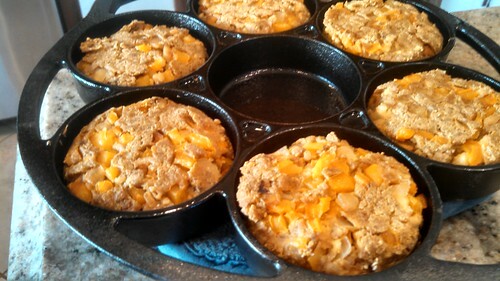 The drop-biscuit pan came out of the oven, heated to 350. 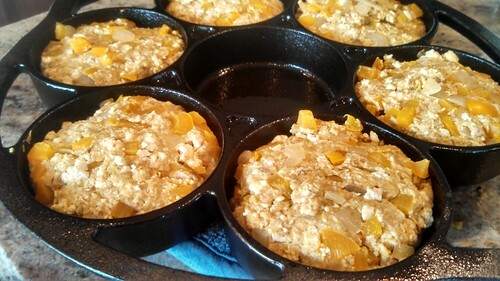 I made 6 good-sized breakfast burgers and put them into the oiled cups. These baked for 10 minutes. I turned them and then baked for 10 additional minutes. They came out nicely browned. Next attempt I’ll use red bell pepper for a more striking look. The oat/besan mixture gets a nice color and these held together beautifully in a nice patty. 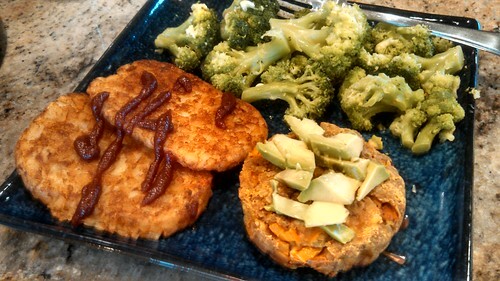 I served them alongside hashbrown squares from Trader Joe’s, a pile of steamed broccoli, and a little avocado on top. There’s a couple of small changes I’m going to make, and I want to see how these pass the “freeze test”, but these may become a great breakfast to-go, particularly for long travel days.